For lunch today 2 of my helpers played nicely to bring me a dish I converted from Damn Delicious. 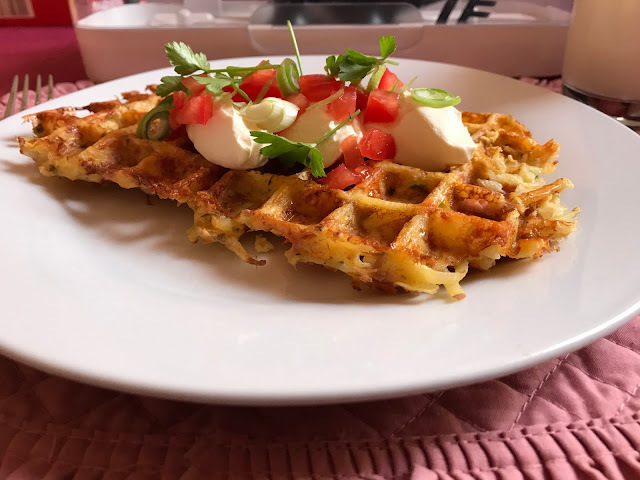 I could probably say 2.5 as I used the Tefal Snack Collection Waffle plates, the Queen of the Kitchen - the Tefal Cuisine Companion and also the grating attachment for the CC. NB! - if you do not have a grater attachment you can grate by hand. As a first go it was quite tasty. I would make a couple of changes for next time. Preheat a waffle iron to medium-high heat. Lightly oil the top and bottom of the waffle iron or coat with nonstick spray. I don't oil or spray my waffle iron. You do what you are used to. Prep by having the onion peeled and halved, the ham chopped, garlic peeled, tomato chopped and spring onion sliced. Grate cheese into bowl speed 10. Remove and put aside. Grate potato on speed 10. Scoop potato out of the bowl and place on a plate with a clean tea towel or a new chux. Wrap potato in the towel / chux and wring out over the sink. Get as much liquid out as possible. Set aside still wrapped in the towel. Do not do this in advance as the potato will go brown if left too long. Change blade to kneading blade and scrape down sides. Add potatoes, ham, cheese, parsley, thyme and paprika; season with salt and pepper, to taste. Speed 5 time 10 seconds - check that it is combined. Remove blade and turn over a couple of times with the spatula. 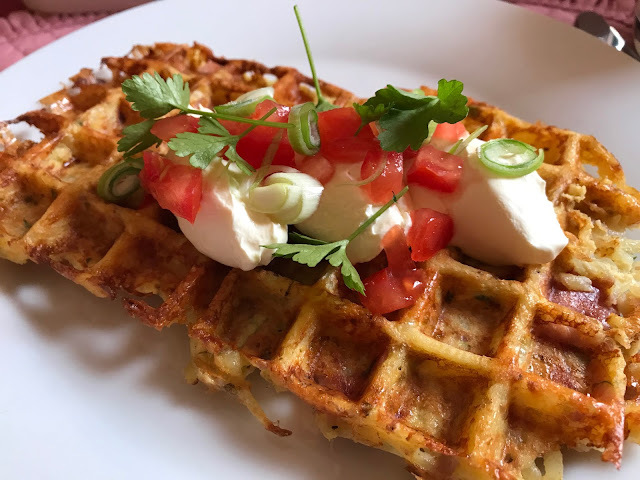 Scoop a portion of the potato mixture into the waffle iron, make sure you get a bit of the egg which will sink to the bottom and spoon over the top. Not too much mixture or egg or it will overflow. Close gently and cook until golden brown and crisp, about 4-6 minutes. Remove from iron and put on a plate lined with a paper towel. I always do this to capture some of the steam that comes off waffles and makes the plate wet. Leave for 1 minute. Serve with sour cream, tomato and spring onion topping.